THE 281 CHAMPION Blackhawks are, back row, from left to right: Co-head Coach Tim McCain, Megan Poyer, Tristan Ziebart, Maddie Vermeulen, Sydney Zeller, Sarah Morgan, Abby Doering, Myah Selland, Tesa Jensen, Tayla Weber, Kayla Olson, Asst. Coach Emily Olson; front row: Erica Howard, Bailey Moody, Alissa Ball, Abby Vermeulen, Madi Moody, Catherine Bechen. 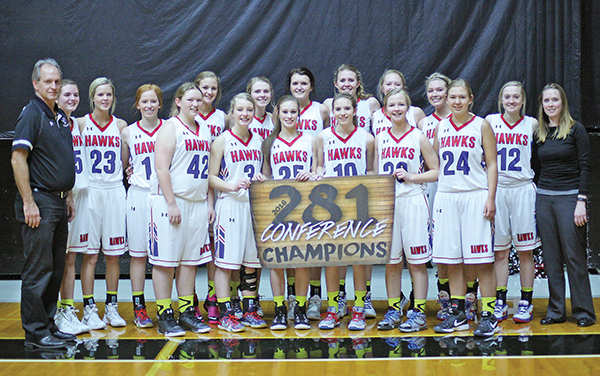 The SCW Lady Blackhawks are back on top of the 281 Conference with a Thursday night win over a formidable James Valley Christian team. Sanborn Central/Woonsocket has appeared in the 281 Championship game every year since its co-op began in 2012 and have a five-year 3-2 record in that game. Myah Selland led in the effort with a game-high 24 points in the 49-38 win for first place. She also recorded seven rebounds, five assists and three steals. Abby Doering added on 10 points, while Maddie Vermeulen had six. Tayla Weber combined offensive and defensive efforts for five points, four rebounds and five assists. As a team, the Hawks had a total 27 rebounds and 16 turnovers. JVC totaled 37 boards and committed just 14 turnovers. Khiree Held led the Lady Vikings with 19 points. JVC fell to 9-3 with the loss, while SCW improved to 8-3. 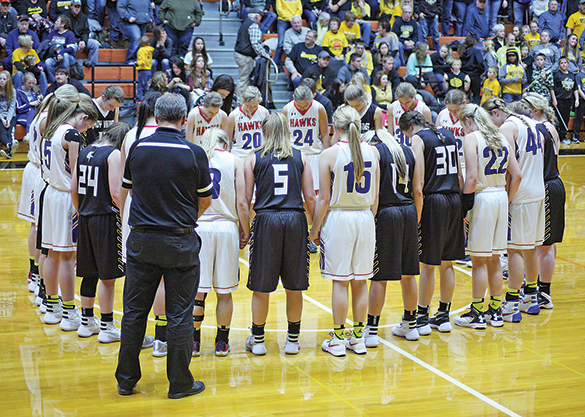 AT THE conclusion of the Girls’ 281 Championship game, players from both teams, the James Valley Christian Lady Vikings and the Sanborn Central/Woonsocket Lady Blackhawks, gathered in a circle to say a prayer for one of SCW’s head coaches, Rob Baruth. After 10 years cancer free, Baruth recently found out his melanoma had returned. He was unable to attend the tournament, as he had surgery the day before at the Mayo Clinic in Rochester. Baruth is now home recovering from surgery and awaiting further treatment. Baruth’s team and Blackhawk fans have taken up the motto, “Same Team Different Fight,” in reference to Tanna Kingsbury’s battle with a rare form of adolescent bone cancer. One month before her 16th birthday, early in the fall of 2014, Kingsbury succumbed to her cancer, 18 months after her initial diagnosis. Superintendent of Woonsocket School Rod Weber presented Ace’s mother and family with a plaque inducting Greg “Ace” Uken into the 281 Conference Hall of Fame Thursday night during the championship games. Pictured from left to right are Rod Weber, sister-in-law Beth Uken, brother Glen Uken, mother Mardella Uken, sister Gina Trebilcock and sister Gloria Damgaard. “Woonsocket’s Biggest Fan” was inducted into the 281 Conference Hall of Fame last Thursday during halftime of the Girls 281 Championship game, in which his home team the Sanborn Central/Woonsocket Lady Blackhawks were playing. Greg “Ace” Uken was an impactful person to the people of his community of Woonsocket. Uken was known for his wholehearted appreciation of sports on every level and for his uncanny knowledge of the games, the teams and the players, at home and throughout South Dakota. Uken was aptly named “Fan of the Year” by Woonsocket School in the spring of 2014, shortly before his untimely death that summer. Greg was the son of a superintendent, the late Leo Uken, and Mardella, who now lives in Sioux Falls. He moved around with his family to Colome, Willow Lake, Bridgewater and Highmore, where Greg went to high school, then settled with his parents and sister, Gina, in Woonsocket in 1978, where Leo served as superintendent. In Woonsocket, Greg found his home, and he became an important part of the community. He was a member of the amateur baseball team and later worked part-time at the grocery store, and did lawn care and snow removal. However, Greg’s true passion and full-time job was following sports. Greg never missed a game, whether it be football, basketball, volleyball or baseball and he was often found at the statisticians table, managing the scoreboard or keeping stats. He was well-versed in all of the rules and regulations of the games he attended and made a point to get to know all of the area coaches and referees. Everyone in the area knew to bring back a program for Ace to collect and study when attending professional or college games. As the rest of his family moved on from Woonsocket, the towns and teams of the area became his extended family. Ace always had a smile, wave and friendly comment about an individual’s favorite sports team. 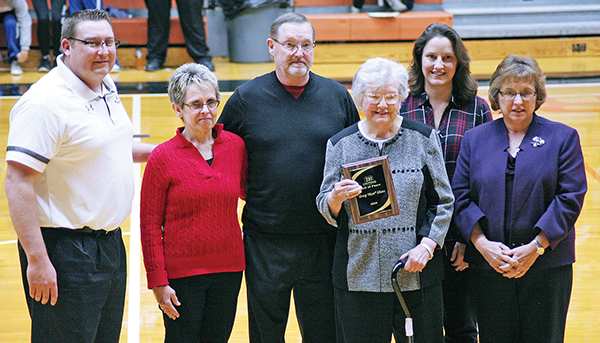 Present to receive a plaque inducting him into the Hall of Fame were his brother and sister-in-law, Glen and Beth Uken, his sisters, Gina Trebilcock and Gloria Damgaard and his mother, Mardella Uken. Woonsocket Superintendent Rod Weber presented Mardella with the honor. 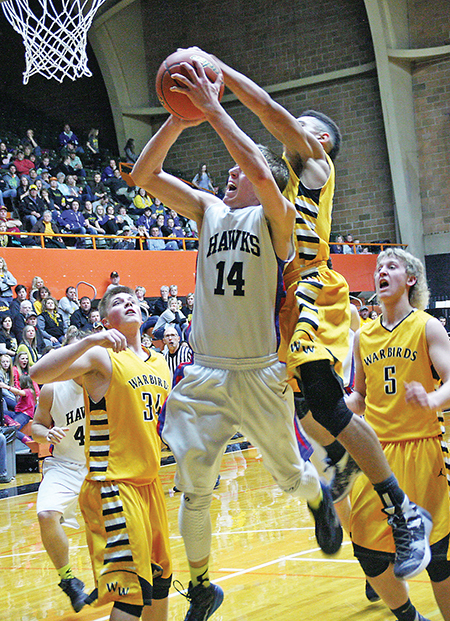 DILLON MOORE battles through a Wolsey-Wessington defender for two of his 12 first quarter points. The Blackhawk boys took home second place in the 281 Tournament last Thursday, falling to a tough Wolsey-Wessington team, 53-65. Dillon Moore burned the net through the first quarter and ended the game with a 17 point, 10 rebound double-double. The senior also had three assists and one block. Brady Tiede helped out under the basket, putting up 12 points and grabbing five rebounds. Josh Feiner added on eight points and Trevor Olson and Tucker Kingsbury each had seven points. Olson also stole the ball three times and Kingsbury got seven rebounds. The Warbirds were led by Darian Ogunjemiliusi’s 13 points, 10 rebounds and two steals. Jarrett Weber also had 15 points. The Blackhawks shot 19-of-53 from the field for 36 percent and 10-of-21 from the free throw line. W-W moved to 11-1 with the win and shot over 48 percent on 37 attempts from the field. SCW also lost the rebounding battle, 27-32.